Volume to be ventilated: 40,000 sq.ft. 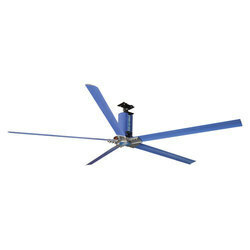 With years of practice of this industry, we are offering Industrial Ceiling Fan. This product is available in varied specifications for our clientele. Kelley Material Handling Equipment India Pvt. Ltd. The technology offered on our HVLS is with the latest Aerofoil Blades, which ensure maximum air flow and minimum power consumption. Ecoair High Volume Low Speed Fans & Exhaust Fans Systems. 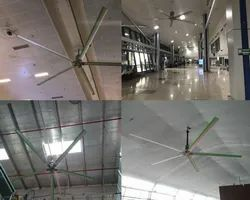 Our industrial ceiling fans that come under the item code of 1050mm generate healthy air and make the weather cooler as compared to the surroundings. They have low power consumption and save energy at a comparatively low range. Their corrosion resistant features make them more attractive to our valued customers.